There’s jazz at the Fowler, and lots of it. Last month, we went to the exhibition opening of Jam Session: America’s Jazz Ambassadors Embrace The World. The exhibition has nearly 100 photographs of legendary jazz musicians from the 1950’s-1970’s. 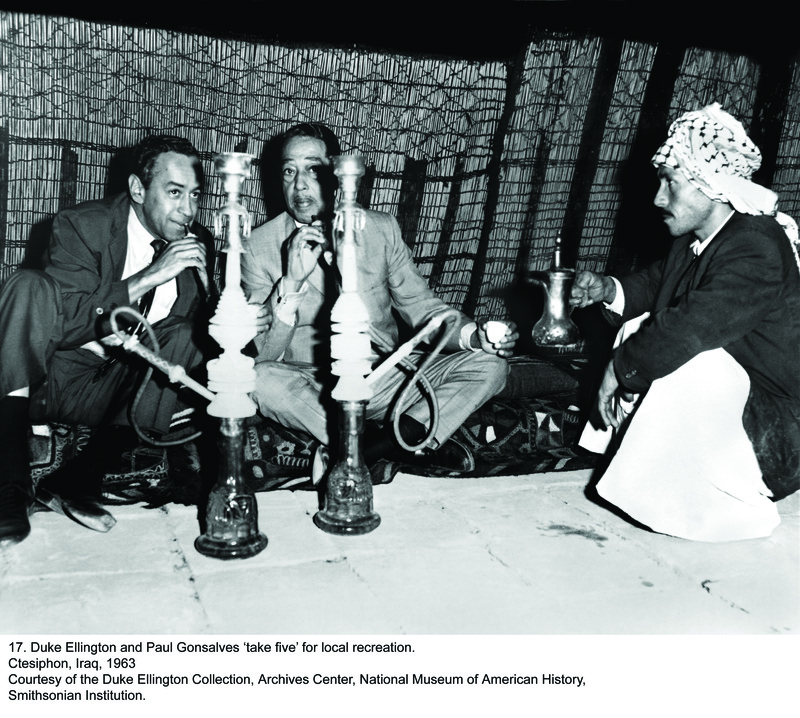 During this period, the U.S. State Department sent Dizzy Gillespie, Louis Armstrong, Duke Ellington, Benny Goodman and other jazz stars on worldwide tours to serve as cultural diplomats. As we entered the gallery, we could see that the exhibition is not your typical photo installation. Yes, there are framed photographs on the wall, but there is also a stage for live performances in the middle of the gallery, equipped with a glistening ebony piano, upright base, and other instruments. A sound score playing in the background adds to the gallery’s cool jazz ambience. This compilation of jazz classics was made just for the photo exhibition and includes performances from the original ambassador tours (playlist). 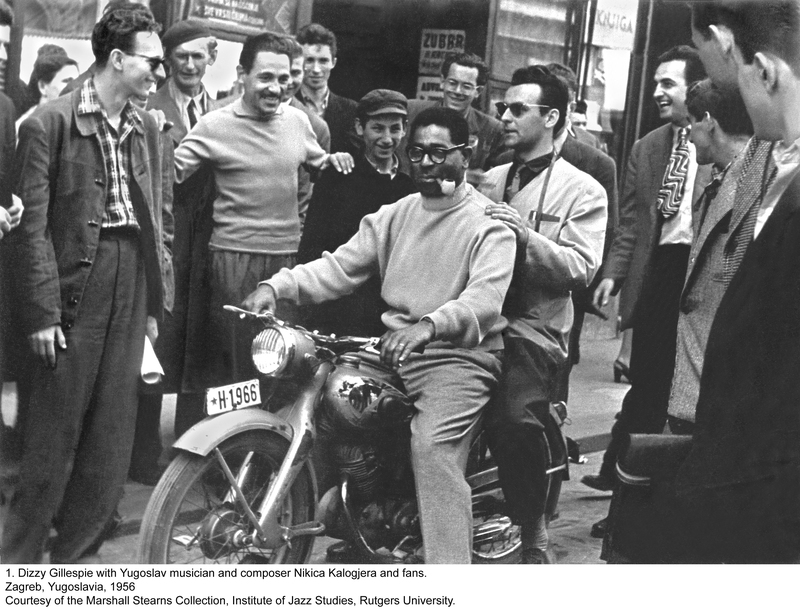 The most striking images document unique cultural exchanges between the American jazz ambassadors and the countries they visited. 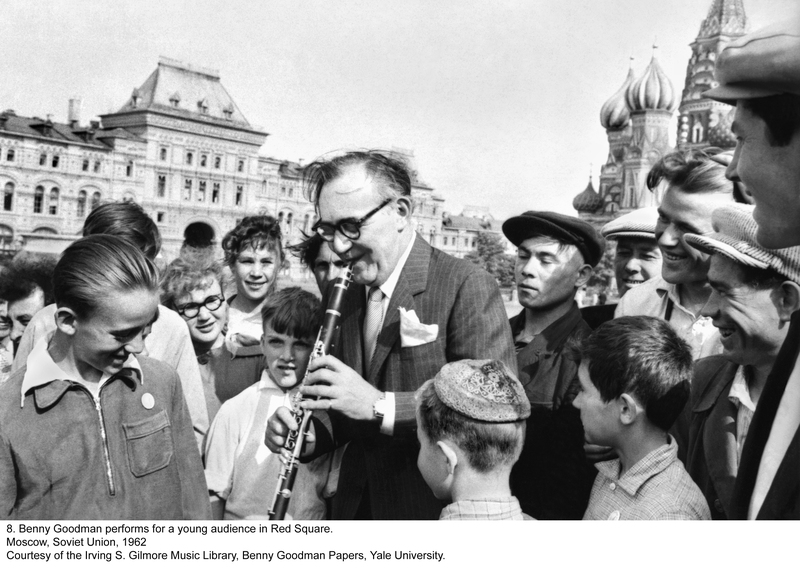 There are photographs of Louis Armstrong playing to a crowd in the streets of Cairo, Duke Ellington sitting cross-legged on Middle Eastern floor cushions smoking a hookah in Iraq, and Benny Goodman entertaining Russians in Moscow’s Red Square at the height of the Cold War. The hip fashions of the era depicted in the photos set the tone — jazz musicians wearing “cool-cat” sunglasses, sharply tailored suits with thin legged pants and skinny ties; and women wearing dresses with tightly cinched waists and full skirts to the knee. Don’t miss seeing this photography installation and the live jazz performances scheduled throughout the exhibition. On your next night out, try the Fowler Out Loud free jazz performance series on Thursday evenings when the galleries are open until 8pm. The show will be on-view from March 20-August 14, 2011. For a preview, check-out the online exhibition.